Given the early nature of the announcement, there are no tech specs or extras detailed as of yet. However, given an earlier Vista Series DVD release of the film, hopes are high that some (if not all) of the same features found on that two-disc version will make their way to Blu-ray. We'll keep you posted. Suggested retail for the Blu-ray has been set at $34.95. 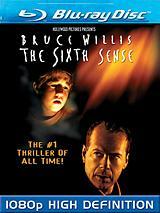 You'll find preliminary specs for 'The Sixth Sense' linked from our Blu-ray Release Schedule, where it's indexed under September 30.